Since 1963, Austad's Golf has had a commitment to helping golfers play better and have more fun on the course. Our Professional Custom Fitters are trained to provide you an engaging and educational experience that helps you play your best golf. If your experience doesn't meet these expectations, give us a call at 1-800-444-1234 or email us at customerservice@austadgolf.com and we'll make it right! 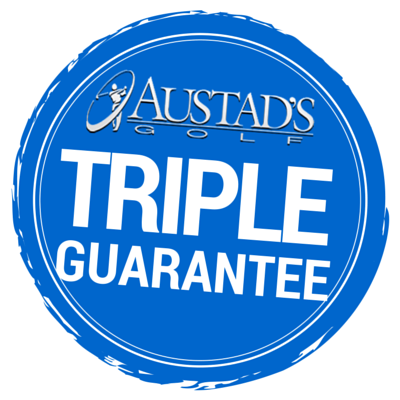 Your satisfaction with any new club purchase from Austad's Golf is assured with our 20/20 Playability Guarantee. If we fit you for a club and you are unsatisfied, return it to us within 20 days and receive an exchange or store credit, less a 20% restocking fee. Austad's Golf is committed to providing value to our customers. We will match any local or national authorized retailer's price on an identical, in-stock item or we will refund the difference within 15 days of your purchase. Austad's Golf is proud to be family-owned and midwest-based since 1963.